Eldar Aliev is not interested in reviving the past. While the noted choreographer respects ballet's rich history, he doesn't believe classic works that have survived with few changes since the 19th century register with 21st-century audiences accustomed to fast-edit, multimedia storytelling. So, when the chorographer set about creating a new version of an old standby - an exuberant pirate tale titled "Le Corsaire" - he threw out everything but its three most famous, bravura sections and started over. "In the 21st-century, when we are losing our audience, and, we are losing it in the States dramatically it's our mission to bring back interest in ballet and to show ballet as a dynamic, entertaining and athletic art form with all its ingredients," Eldar Aliev said. "And that's what I try to do in all my productions, whether it's in 'Corsaire,' 'A Thousand and One Nights' or 'Firebird.' Basically, I'm trying to make these productions attractive for today's audiences." The Colorado Ballet will open its 2007-08 season this evening with the second presentation anywhere of Eldar Aliev's "Le Corsaire," which he created in 2005 for Indianapolis' now-defunct Ballet Internationale, where he was artistic director. "We're trying to build an audience, obviously," said Gil Boggs, Colorado Ballet's artistic director. "It's a very rousing, entertaining, very athletic sort of male-oriented ballet. "Yes, there are the ballerinas, but the males really have a lot of wonderful dancing to do in it. And I think it's very exciting, and it puts a different spin on what people think of as ballet." Loosely based on the poem "The Corsair," by Lord Byron, the ballet centers on Medora, a young Greek woman, and Conrad, a pirate, who fall in love after he rescues her from the clutches of an evil pascha. They undergo misadventures of all kinds, finding themselves all alone in the end after a harrowing shipwreck. Boggs, who performed in American Ballet Theatre's "Le Corsaire" when he was a member of the New York company, didn't want to present that version. It lasts nearly three hours, and he didn't think Denver audiences would enjoy it. As an alternative, a ballet mistress at Ballet Theatre suggested he look at Aliev's take on the classic, and Boggs liked what he saw. "This one is fast-paced," Boggs said. "A simple story line. It's very colorful. Brand-new sets and costumes, which I think are very beautiful." 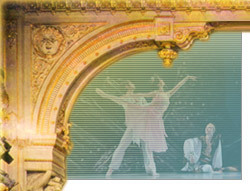 The Colorado Ballet is using the sets and costumes made in St. Petersburg, Russia, in 2005 for the Ballet Internationale production and not seen since. The scenery was designed by Simon Pastukh, and Galina Solovyeva oversaw the costumes. The two main roles will be performed by three rotating sets of dancers: Alexei Tyukov and Sharon Wehner, Igor Vassine and Chandra Kuykendall and Janelle Cooke and Shunsuke Amma. The first adaptation of "Le Corsaire" was performed in London in 1837, but it was soon eclipsed by Joseph Mazilier's version, which debuted at Moscow's famed Bolshoi Theatre in 1856. Famed choreographer Marius Petipa reworked it yet again for the Kirov Ballet in 1899, and it is that version that has endured with slight modifications until present day. Many famous dancers have performed the main roles in "Le Corsaire," including Alla Sizova and Yuri Soloviev during the Kirov's American appearance in 1961 and, later, Margot Fonteyn and Rudolf Nureyev. Aliev, a principal dancer with the Kirov Ballet for 13 years, first appeared in the title role when the company revived Petipa's ballet in 1986. In 1999, the famed Teatro Colon in Buenos Aires asked him to choreograph a new version of the piece, but he didn't feel he was ready at the time. He finally decided to take a stab at it in 2005, after redoing a string of other classics, such as "The Sleeping Beauty," "Giselle" and "Swan Lake." "'Corsaire' was a dying ballet, and I didn't want it to die," he said. The choreographer tightened the story, cutting the work to two acts and giving it a running time of about two hours. "What I'm trying to do is to keep our audience and build our audience by producing productions like this - by updating, by changing, by adapting for the audiences of today, using the athleticism and the progress in the technique of dancers of today," Aliev said. But unlike some ballet choreographers who incorporate elements of other dance styles, he stayed faithful to the classical tradition. "It's true classical ballet in all its clarity and purity," he said.